MOURNING GREY has premiered the official "Scarred" music video. The track comes from the band's brand new EP, Hollow, which debuted last month. Hollow is available now on digital outlets worldwide via Pavement Entertainment. Watch the video now on KNAC.COM HERE. The video focuses on the foursome playing to the backdrop of a harsh desert with a plane covered in graffiti. Clearly, the emotions in "Scarred" are as raw as the elements of the barren landscape in the video. MOURNING GREY does not hold back, belting out the vocals and instrumentals in this gutsy track about heartbreak. While the song talks about the scars and depression heartbreak leaves you with, vocalist Benjamin Chapman notes, "In the end, "Scarred" talks about living with the sickness. Even a person who has been destroyed and terrorized can overcome it." Hailing from Phoenix, AZ, MOURNING GREY is at the forefront of the hard rock/alternative metal scene in the Valley of the Sun. 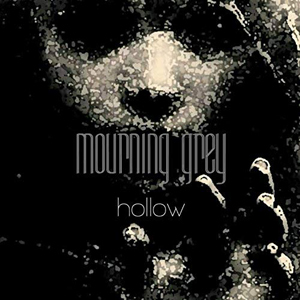 MOURNING GREY features heavy, bass-driven songs with melodies that get stuck in your head and lyrics that definitely make you think. Lyrically, the songs really dig deep into the struggles of life, but also the strength to overcome them. Hollow will surely prove them to be a driving force in the rock world and beyond. To stay updated on MOURNING GREY, visit their official Facebook Page.